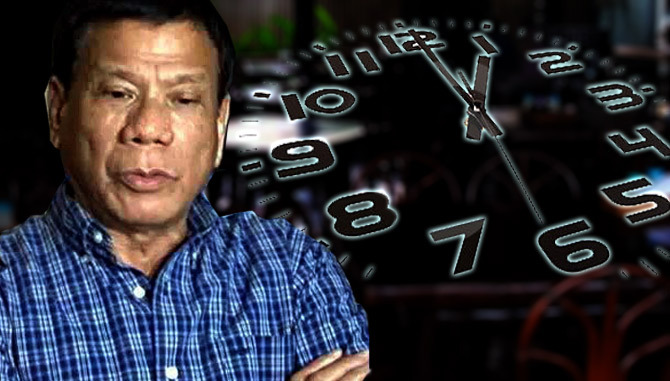 Davao City Mayor Rodrigo Duterte wants to implement a nationwide curfew if he becomes president. Here's what you should know about the issue. We've had enough of the misconceptions and lies and the black propaganda against Duterte on social media, now it's time to know the truth. And there's no better way than knowing it from his spokesman. In a Facebook post, former Davao City councilor Peter Tiu Lavina clearly explained Duterte's policies in Davao that could be replicated in the entire country if he is elected president in the 2016 national elections. The curfew in Davao at 10 p,m. is for unescorted minors. That's to keep our children off the streets and should be at home sleeping or preparing for school the following day. 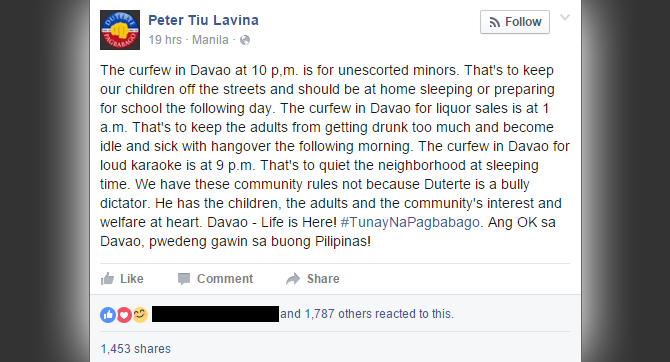 The curfew in Davao for liquor sales is at 1 a.m. That's to keep the adults from getting drunk too much and become idle and sick with hangover the following morning. The curfew in Davao for loud karaoke is at 9 p.m. That's to quiet the neighborhood at sleeping time. We have these community rules not because Duterte is a bully dictator. He has the children, the adults and the community's interest and welfare at heart. Davao - Life is Here! ‪#‎TunayNaPagbabago‬. Ang OK sa Davao, pwedeng gawin sa buong Pilipinas! Duterte's detractors are on the loose and will do everything to discredit the leading presidential candidate. Be vigilant in what you read or share here in FB. Trolls are lurking everywhere to post, plant, attribute stories in other people's names, share and spread lies and dis information. Because they cannot write anything good about their principals, their mercenary mission is to sow confusion and destroy other people's good name.